„Pulling together“ in a multidisciplinary way – the partners of the AgilHybrid consortium at the kick-off workshop at WILO SE in Dortmund, Germany. 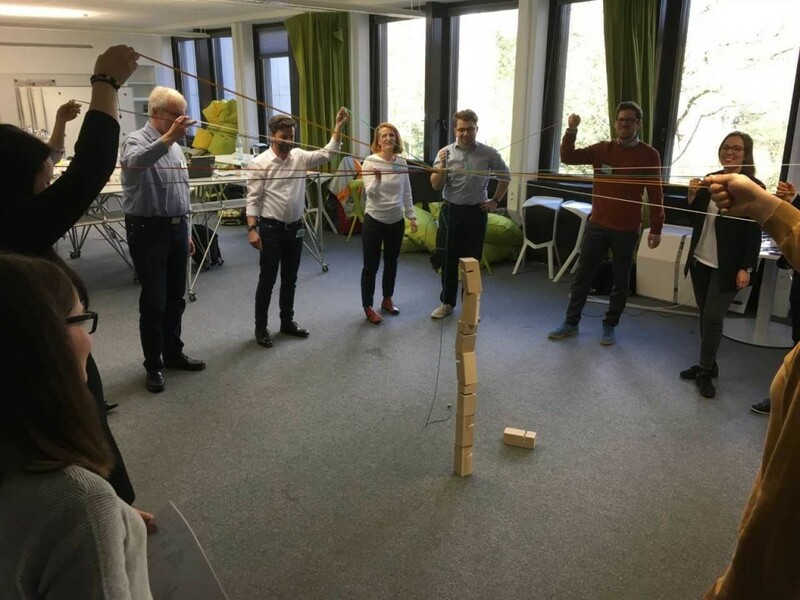 On 7th and 8th of March 2019 the big kick-off workshop for the consortium project “Agile competence development for interlinked work in hybrid business models in the SME segment” (AgilHybrid) took place in Dortmund, Germany. Launched at the beginning of the year, the project aims at developing learning and teaching modules for employees who in the course of it learn to better understand digitization and corresponding changes and to autonomously develop SMART products and services. Besides personal workshops, a customizable online platform will be provided as part of the project. The platform will allow employees in enterprises that are traditionally characterized by technical aspects and logics of production to systematically build competences for tomorrow’s hybrid world of work. In doing so, excellent and tailored customer solutions will be worked out that are accompanied by innovative business models. Employees will be specifically equipped for future tasks in digitally interlinked systems. Considering dimensions of good work, their motivation will be strengthened, and reservations will be reduced. Thus, AgilHybrid will create the tools and preconditions for a digitally integrated work in the future. Funded by BMBF and co-funded by ESF, the project will run until December 2021 and is characterized by an interdisciplinary collaboration of the consortium partners and further interested parties. Apart from the project coordinator WILO SE, the business partners BLANCO GmbH + Co KG, Kölling Glas GmbH & Co. KG and Viessmann Digital GmbH participate in the project. The academic partners alongside HHL Leipzig Graduate School of Management include the University of Applied Sciences Karlsruhe and the Martin Luther University Halle-Wittenberg. The e-learning provider SupraTix GmbH will ensure the consistent implementation of the developed methods into a viable online offer that guarantees a customized configuration for interested third-party companies. VDMA and the Technology Consulting Centre of DGB Nordrhein-Westfalen e.V. (TBS) will ensure the wideranging transfer into SME enterprises and entities representing the interests of employees.